The difference between our balloon and other, previously offered ones is that its volume can be adjusted by the help of a valve and it can be left in the stomach even for one year. 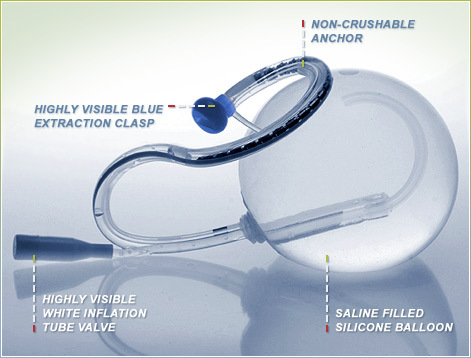 The balloon is made of tissue-friedly silicone resistant to gastric acid or other mechanical impacts and is filled with physiological saline solution. Patient age should fall between 18 and 60 years. Endoscopy (gastric) to assess the suitability for insertion (screening for exclusion criteria e.g. gastric ulcer, tumor, polyps etc.). This procedure can be performed under a short general anaesthesia as well. Once the suitability has been confirmed, the balloon is inserted during an endoscopic intervention carried out under a short general anaesthesia. It means that the patient will be allowed to leave the clinic on his/her own feet with a companion after a 2 to 3-hour post-insertion observation period. If it is thought to be necessary by the specialist further observation will be ensured on our inpatient department. Nausea, vomiting may occur 2 to 3 days after the insertion of the balloon since the body must get used to the feeling of fullness caused by the balloon. Once the symptoms have ceased you may return to your everyday life again. Regular follow-up visits and dietary consultations, monitoring of body weight based on specialist’s consultation. If the rate of weight loss is insufficient the volume of the balloon can be increased further. In case of weight loss greater than expected, regular episodes of malaise or other complaints volume of the balloon can be reduced by deflation. Both procedures are performed with endoscopy. Once the targeted weight has been reached the balloon will be removed endoscopically under sedation, based on a pre-determined appointment. Balloon insertion procedure is not financed by the National Health Insurance Fund Administration in Hungary (OEP). We hope you to find sufficient information here. For further information, please do not hesitate to contact us at the contact details listed below. If you decide to have a Spatz balloon inserted, please make an appointment.